At a time when we’re celebrating our country’s athletic achievements on the podium in Rio, there’s some gold medal achievements worthy of celebration here on home turf. Eric Auerbach is the Canadian National Strings Champion. 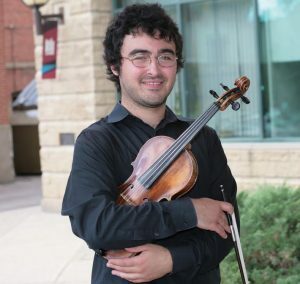 Auerbach, who is 26 year old violinist, competed in the Calgary Performing Arts Festival at MRU in the spring, then went on to win at the Provincial level in Edmonton and just capped the triple-crown winning at the National level, also in Edmonton, this August. 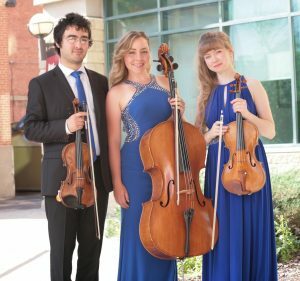 The hard work paid off as the trio, coached by John Thomson who was in the audience in Edmonton for support, was also awarded with first prize in the chamber music division. Christmas in Song kicking off the season early! Mount Royal Conservatory is getting a head start on the festive yuletide season with its Christmas in Song concert Saturday, Nov. 29, 2014. Now in its 26th year, Christmas in Song has delighted family audiences with a mixture of holiday favourites, classical masterpieces and traditional carols. It’s become a treasured part of the city’s holiday festivities. 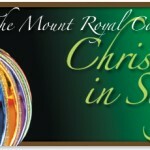 Christmas in Song is an excellent showcase featuring the talents of the Calgary Youth Orchestra, and Mount Royal’s family of choirs: Arietta, Arioso, Artio and Kantorei. This year, the Conservatory’s Jazz faculty and students will be adding some seasonal swing. Performers will be sharing the stage with Calgary’s Heebee-jeebees, the popular a cappella group made up of several Mount Royal choral alumni: Cédric Blary, Chris Herard, Ken Lima-Coelho, and Jonathan Love. For some of the children in Arietta and Arioso, this is their first performing experience. The Conservatory is especially pleased to collaborate once again with Glencoe Resources, its long-time partners in Christmas in Song. September signals back to school at Mount Royal Conservatory for students, music educators, and new events for concert goers. Our Academy for Gifted Youth is gearing up with fresh faces, auditions are underway for our family of youth and adult choirs, and our ensembles, Calgary Youth Orchestra, early childhood programs and speech arts will soon be in full swing. But fall classes and activities aren’t just for children. Research shows that group classes and private lessons for adults enrich lives. 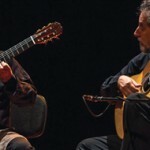 Life-long learning benefits everyone, whether learning to play an instrument or singing as a hobby, or private speech arts lessons for boosting your career in the boardroom. Curious? See what the Conservatory is offering and join us. A free early season family concert aimed at recruitment, featuring the Senior Choir and a variety of child-friendly post-concert activities. 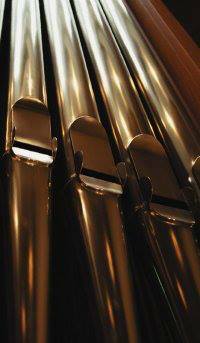 A family holiday tradition and a celebration the season with the joyful sounds of Mount Royal Conservatory. 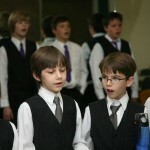 Christmas in Song has been a treasured part of Calgary’s holiday festivities for nearly three decades. This, our 26th annual concert, will feature Mount Royal’s Arietta, Arioso, Artio and Kantorei choirs, the outstanding Calgary Youth Orchestra, and a surprise line-up of special guest artists. 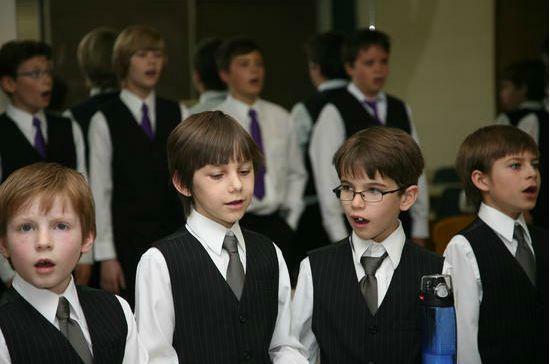 This will be a full-length, ticketed concert event featuring both levels of the Calgary Boys’ Choir in music celebrating the glories of winter, wildlife and scenery. 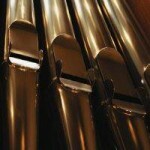 Calgary Youth Orchestra is off to Germany! The Calgary Youth Orchestra is off to tour Germany. The Calgary Youth Orchestra is launching its tour of Germany in celebration of Richard Strauss. UPDATE: You can tour along with them on their blog! The CYO leaves Monday, Aug. 4 for a 10-day, four-concert tour with performances in Berlin, Leipzig, Augsburg and historic Jüterbog, to celebrate the 150th anniversary of the birth of Richard Strauss. 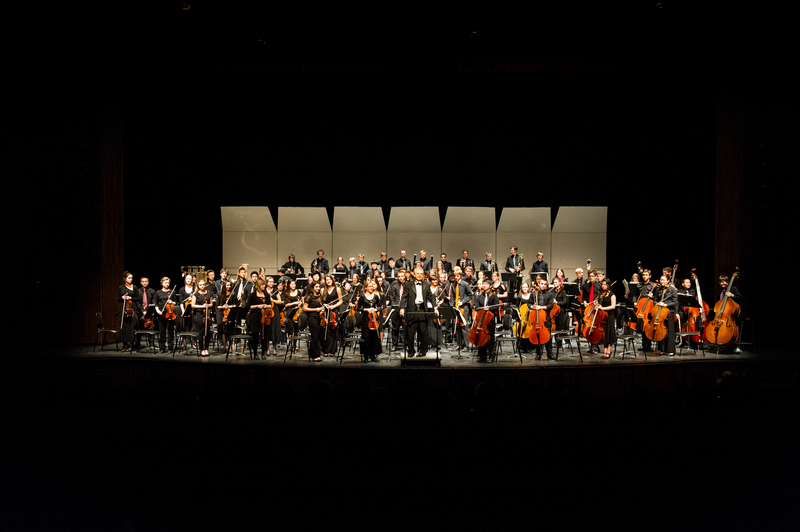 The 65-member orchestra is one of Canada’s leading community youth orchestras. Members include Calgary and area junior and senior high school students and students of Mount Royal University and the University of Calgary. Cellist Mary Lena Bleile will be making her European premiere as a soloist playing the first movement of CPE Bach’s Cello Concerto in B flat.